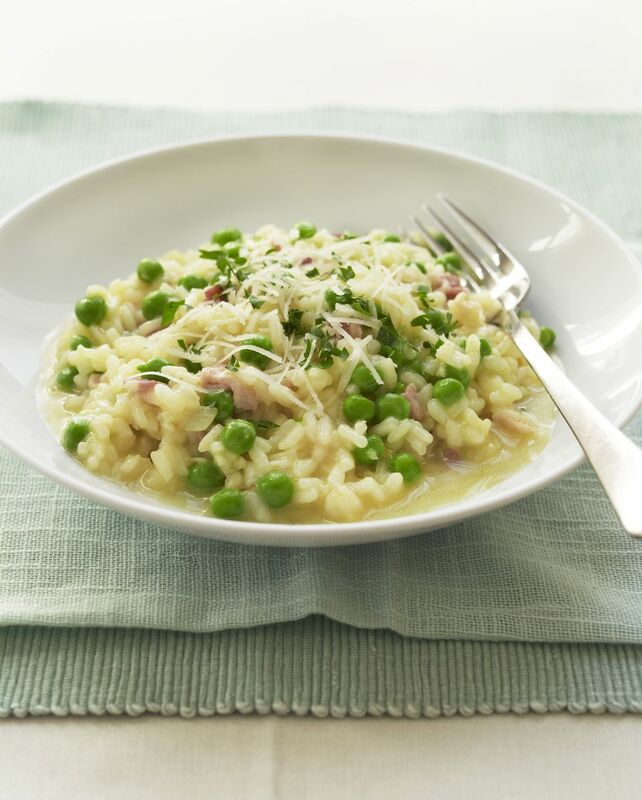 Crockpot risotto is a wonderfully easy way to make a classic Italian dish with little effort. When making risotto the traditional way on the stovetop, you have to stir and stir to get the rice to release its starch as it cooks. In the slow cooker, you only have to stir twice, and this recipe will taste just like the traditional rich and creamy dish. This recipe only takes two hours to make in the crockpot, so it's not one you can turn on and then leave the house. You do have to stick around to stir and add ingredients. Arborio rice is a short-grain rice with lots of ​amylopectins, a branched starch that makes the finished dish so creamy. It's essential for the success of this dish. The pear nectar adds a slightly floral flavor to this recipe, and the wine adds wonderful flavor. Just add more chicken broth if you don't want to use wine or pear nectar. The last time I made this I stirred in some chopped ham leftover from Easter. It was marvelous. You can also add cooked chicken, shrimp, or even meatballs. Serve this recipe with a crisp green salad and some breadsticks or hot savory scones. In a medium saucepan, melt 2 tablespoons butter over medium-low heat. Add the onion and shallot; cook and stir until tender, about 5 to 7 minutes. Add the rice; cook and stir until the rice is slightly toasted, about 3 to 4 minutes longer. Place the rice and onion mixture in a 3-quart slow cooker. Then, in a medium saucepan, combine the chicken broth, wine or pear nectar, and salt and pepper. Place the saucepan over low heat to warm. Turn on the crockpot to low. Add the warm broth mixture and stir well. Cover and cook on high for 1 hour, then remove the cover and stir. Cover again and cook 45-55 minutes longer until rice is almost tender. You may need to add another 1/2 to 1 cup of the broth if you like a soupier risotto. Stir in the peas and 2 tablespoons butter. Cook on high 15 to 20 minutes longer until rice is tender. Stir in the cheese, turn off the slow cooker, and let stand 10 minutes. Stir again and serve immediately. If you happen to have some leftover ham handy, consider slicing it up and adding to this delicious dish.